MILWAUKEE, Wisconsin, February 16, 2015 — After just one month of training as a professional athlete CM Punk is continually in the spotlight. The former WWE Champion (fake, as in, not real wrestling) is currently training at Roufusport in Milwaukee for his pending UFC debut. Philip Brooks — as he is known via his birth certificate — is steadfast in working hard and making a splash when he steps into the UFC Octagon(R) in the near future. 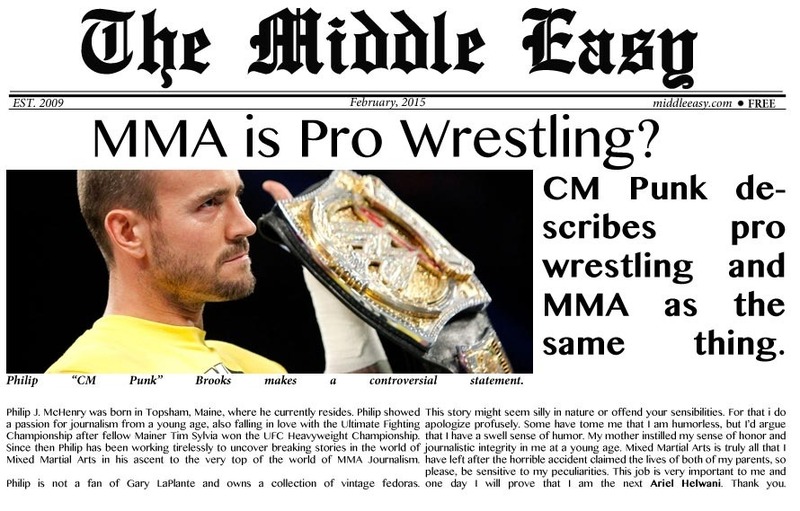 One statement that he gave to a local news outlet has made some waves on the internet MMA community of late, that being that “MMA is professional wrestling.” The statement, if taken in context, explores the history of MMA and professional wrestling and how once upon a time professional wrestling was “real” but verged into the realm of showmanship and predetermined outcomes to best make money and draw crowds. Since then professional wrestling has turned into a circus sideshow while MMA has become a legitimate sport headlined by consummate professionals and is overseen by sanctioning bodies to snuff out cheaters. There is still no debut set for CM Punk just yet, although he does think that October, November or December seems plausible. He did not share his thoughts on what else is professional wrestling, such as roller derby or reality television, though. Next articleRussia’s M-1 Global to host medieval jousting. Of course.